If you don’t know who Shoko Nakagawa is, you have missed out on one of the most entertaining, funny, and truly moe idols ever. She is not only a successful gravure idol, but she can also sing, act, and is one of the biggest otaku in the world! Yep, you heard me. She is probably more of an otaku than you or I will ever be. Here are 5 reason why Shokotan is so awesome after the jump. 1. She’s more talented than your average Japanese Idol. Not only is Shoko Nakagawa a triple threat idol (voice actor, live performer, magazine/photobook girl), she was crowned Miss Shonen Magazine in 2002. She has done countless cosplay photo shoots. And she is also a skilled illustrator. 2. She holds the title for Blog Queen. As of February 2008, Shoko Nakagawa’s blog, Shokotan*Blog, had one billion hits! Some would say she’s addicted to blogging. With all of the attention her blog receives, she has become the “official” idol of 2ch forum. In September of 2005, Koma books released a complication of her blog entries as a book appropriately called Shokotan*Blog. She even created an English blog for her American fans during her Anime Expo visit. 3. She knows her anime/manga history. She received her first manga, Gegege no Kitaro, from her father. Since then, she has been obsessed with anything she can get her hands on. She loves older anime, manga, and idol music. She is known for giving her fellow idols lessons on Otaku culture whether they want it or not. 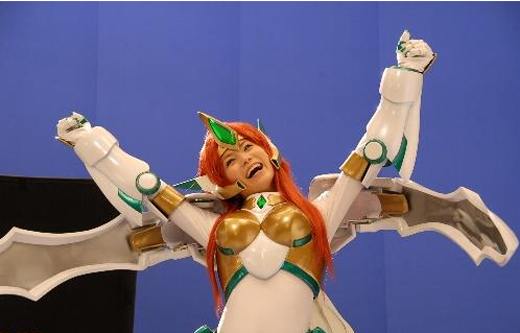 Just ask famous idol Akiko Wada who even had to dress up as Rei Ayanami from Evangelion because of Shokotan. 4. She doesn’t forget her fans. Even though she is a big time idol, she still takes the time to interact with the community as much as possible. She regularly keeps conversations going on her blog, and shares intimate glimpses into her life. More recently, she participated in this year’s Anime Expo. Shoko Nakagawa seems to be really interested in American fans, and made it a point to interact with as much of them as she could. 5. She truly loves the otaku life. Just as Densha Otoko shined a positive light on the once frowned upon otaku community, Shoko Nakagawa is determined to doing the same. She is the epitomy of everything good about the otaku community. I hope if you weren’t a fan of her before, you are now. She will be around for a long time to come. I know I said I would only give you 5 reasons why she’s so awesome, but I just couldn’t fit this into any other reason. I’m a big fan of cats. If you have checked out her blog by now, you may have seen she has an addiction to cats. On occasion, she even loves to taste them. Sanrio has even made a line of toys that has Hello Kitty eating Shokotan as a tribute to her love of cats. Since she took in her first abandoned cat, she has always had a love for them. Currently she owns 4 cats. Chibita (named after Neco Nekomura from Kyo no Nekomura-san), Mami (named after Magical Angel Creamy Mami), Luna (named after Luna from Sailor Moon), and Raijiro (named after Yujiro Hanma from Baki the Grappler). Mami even has her own photobook for sale on Amazon Japan! Who should be the #1 gravure idol?